PPF, opportunity cost and trade with a gains from trade example, a summary - FreeEconHelp.com, Learning Economics... Solved! 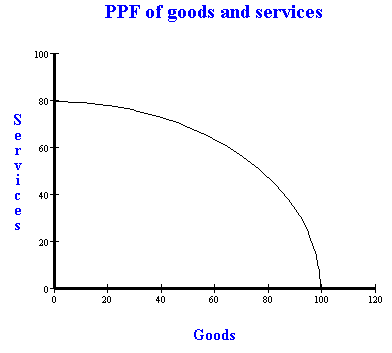 Production possibility frontier, a graph that shows the combinations of goods and services that can be produced if all of society’s resources are used efficiently. 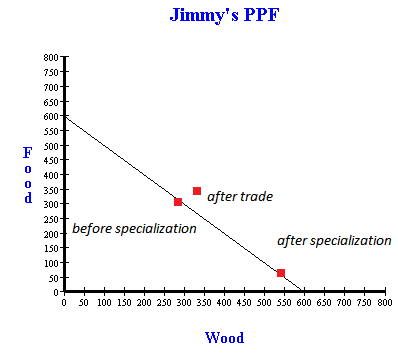 The opportunity cost of 20 wood is 10 food, or the OC of 20 wood = 10 food. Now divide both sides by 20 to get: The O.C. of 1 wood =10/20 food= .5 food. This is the answer we want. If you always set up your information like this you can easily calculate the opportunity cost for any question. Also note that the opportunity cost gives us the slope. You can see from the graph that food is on the Y access so it is equal to rise. While wood is on the X axis, so it is equal to run. By looking at the difference in rise/run we get -.5, which is equal to our opportunity cost or trade off (only negative, which should make sense). 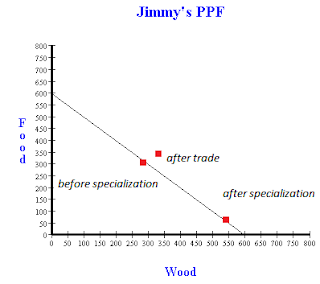 We can also see from the three points in the graph that any point within the PPF is inefficient. This means that we can reallocate our resource inputs to produce more food and wood. We can keep doing this until we reach the PPF curve, and at this point we are efficient. Any point outside of the PPF is not attainable given current circumstances. However, we will show in a minute how it is possible to consume outside of the PPF. Another term for this opportunity cost and negative slope is the marginal rate of transformation (MRT). 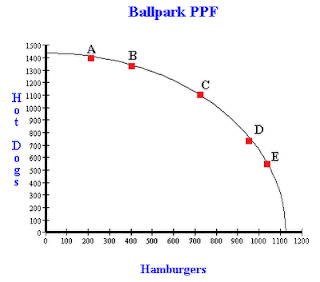 This term is identical to the opportunity cost and slope of the PPF. It means that when we produce more of a given good, we have to give up production of another good. This “give up” is the transformation, and since we are looking at two goods, we analyze them in terms of a ratio. The first PPF for Jimmy showed the case where we have constant opportunity costs, meaning that the slope doesn’t change, or the PPF is linear. Most PPFs are concave, or have a bowed out curve, which signifies increasing opportunity costs. Let’s go through a table and construction of this type of PPF. 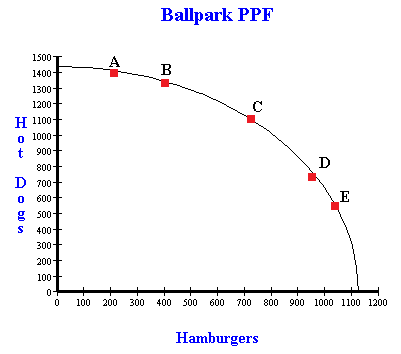 You can see that we now have a bowed out PPF graph, which indicates that the opportunity cost of hamburgers is increasing as we move from point A to B to C, etc. The OC of 200 hamburgers = 100 hot dogs. The OC of 1 hamburger = 100/200 hot dogs = .5 hot dogs. The OC of 360 hamburgers = 280 hot dogs. The OC of 1 hamburger = 280/360 hot dogs = .77 hot dogs. The OC of 240 hamburgers = 220 hot dogs. The OC of 1 hamburger = 220/240 hot dogs = .92 hot dogs. The OC of 100 hamburgers = 200 hot dogs. The OC of 1 hamburger = 200/100 hot dogs = 2 hot dogs. You can see that the more hamburgers we produce, we have to give up more and more hot dogs to get them. The idea behind this is that input resources are good at producing different things. If we try to use all of our resources to produce hamburgers, then some won’t be that effective at it. 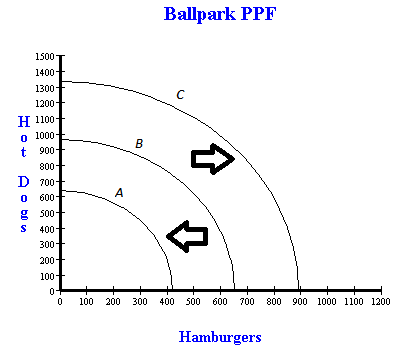 However, if we balance production, and use those resources that are good at producing hamburger to make hamburgers, and those that are good at producing hot dogs to make hot dogs, then we get the bowed out shape of the PPF, and not the linear version. What causes a PPF to shift or change? When we draw a PPF we are holding everything constant, and are taking a snapshot in time of what a country or individual is able to do. If anything changes, such as employment, technology, population, or input resources then we will have to change the PPF. For example, we begin on PPF B, and can shift to PPF C if we have growth in the economy, more people, more resources, or better technology. Also, we can shift to PPF A if we have a disaster in the economy, such as hurricane Irene which destroys capital which will lower the total amount of goods that we can produce. Another example of a change in the PPF shows the tradeoff between consumer goods and capital goods (also known as investing). 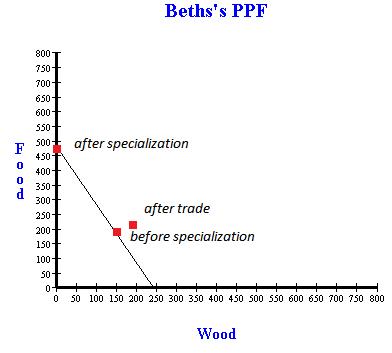 By producing more capital goods, we can move the PPF curve out in the future to produce more of the consumption goods. In this scenario, we have to choose between producing ovens or tortillas. By producing tortillas, we are happy in the short term (not hungry), but we can’t produce more tortillas in the future. 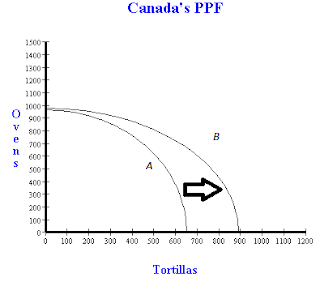 By producing more ovens now, this means we can shift to PPF B, which will allow us to produce even more tortillas in the future. To proceed in this problem, we need to figure out who has the comparative advantage in each good. Now is also a good time to introduce the idea of absolute advantage. Absolute advantage means that an agent can produce more of something using fewer resources, while comparative advantage means that an agent has a lower opportunity cost to produce a given good or service. In our example, Jimmy has the absolute advantage in both goods, because he can produce more of either good, being able to produce 600 of each good monthly as opposed to Beth being able to produce only 240 wood monthly, or 480 food monthly. His opportunity cost of producing 600 wood is 600 food. (we can use these total amounts since the lines are linear). So: The OC of 600 wood =600 food. Or the OC of 1 wood =600/600 food = 1 food. Likewise, the OC of 600 food = 600 wood. Or the OC of 1 food = 600/600 wood = 1 wood. 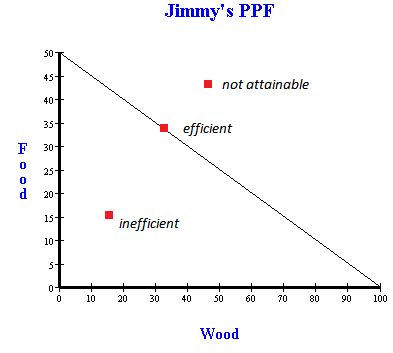 So for Jimmy the opportunity cost is always 1. The OC of 240 wood = 480 food. Or the OC of 1 wood = 480/240 food= 2 food. Likewise, the OC of 480 food = 240 wood. Or the OC of 1 food = 240/480 wood = .5 wood. You can see that the opportunity for either good is simply the inverse of the other, meaning the OC for 1 wood is 2 food, so the OC for 1 food is ½ (the inverse of 2). We can see this for Jimmy as well because 1/1=1. So who has the comparative advantage in each good? Beth can produce food at a lower opportunity cost, so she should specialize in food, while Jimmy specializes in wood. Then can then trade at any rate between their opportunity costs in order to consume more than their original PPFs would have allowed them. You can also see that when specializing, there is more wood and food in the economy as a whole then before, when they were just producing for their own consumption. A good question to figure out now, is what are the terms of trade? Is it possible that at certain terms of trade, no benefits would be had? Also, think about the scenario when there trade partners don’t have a comparative advantage, meaning their opportunity costs are equal. Is it possible to have gains from trade in that scenario?